This product requires a prescription and is only shown here for demonstration. Please schedule a Free cosmetic consultation to determine whether you are a candidate for this product. 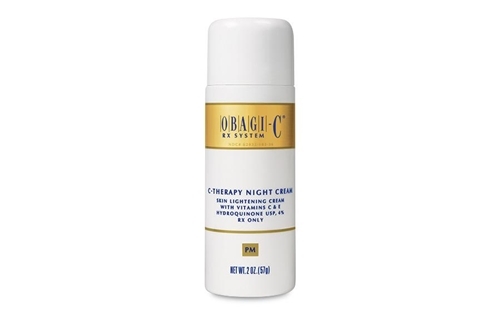 Obagi-C Rx System C-Therapy Night Cream works overnight to optimize the natural skin renewal cycle, revitalize skin, and help to reduce irregular melanosome activity. The cream utilizes a potent antioxidant blend of Vitamin C and E in combination with 4% Hydroquinone to even skin tone and reduce the incidence of fine lines and wrinkles. Regular use of Obagi-C Rx System C-Therapy Night Cream will help correct hyperpigmentation and make skin smooth and radiant.